In the year 21XX, humans co-existed with Reploids. These amazing cyborgs have the same ability to think and reason that humans do. But they're not human - they're machines. World peace had been achieved. Hunters started to forget the days of constant battle. But one day, a saboteur hacked into the Mother Computer at the Hunter Base. The data in the computer was rewritten, changing the way the Reploids operated. The world was gripped by chaos and confusion as a result of this dangerous hack. In a desperate attempt to stop the chaos, the Hunter Base called in Megaman X to take on the dangerous mission. Who hacked the Mother Computer? What is this invisible enemy's purpose? Now Megaman X prepares for battle, ready to protect world peace and save the planet! --From the GBC Mega Man Xtreme instruction manual. 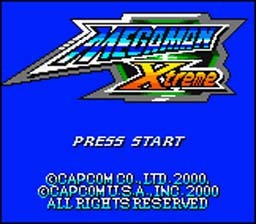 Play Mega Man Xtreme Now! started to destroy all that the Maverick Hunters have worked so hard to achieve. It is not too long before Mega Man X and Zero discover that someone will have to enter the Mother Computer. Mega Man X is the first to jump up and face off with past Bosses that he has defeated long ago. Once that is completed, Mega Man X will face off with Geemel and Zain. Mega Man X has three basic maneuvers you'll have to master in order to crush the robot masters. X Buster- Your X Buster has infinite ammo and is your primary form of attack. You can charge your X buster for two more powerful levels of attack, medium and large. Jump- X has the standard Mega Man jump, and the wall jump. You can jump off of any wall you're touching. You can even jump up the wall repeatedly to climb it.